The School for the Arts Community Organization (SACO), our school’s version of a parent-teacher organization, is hoping to broaden participation in our organization to benefit the school during the upcoming school year and beyond. We would love to see more familiar and new faces at our monthly meetings, but if you aren’t able to attend monthly meetings, there are many ways to contribute your time and talent in support of SRCSA’s wonderful kids and teachers. In addition to classroom activities and arts-integrated education, there is a certain rhythm to the school year: we start with an ice cream social, where everyone is invited to come together before school starts. The SEED campaign, where we ask school families to donate $100 per student, always starts in August and ends in September. 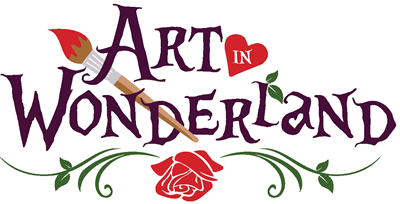 Art Walk, our school’s major fundraiser, is always in October and it is one of the most fun days at school. There is an annual canned food drive. Every year, parent volunteers organize a school yearbook, which is loaded with beautiful photographs of our students and school community. A weekly email from SACO goes home outlining events and activities; this email is deployed 40+ times during the year. The students enjoy a fantastic Book Fair/Literacy Week in late February/early March. There is an evening adults-only Spring fundraiser that brings us together for community and to raise funds for special projects. We appreciate teachers year-round and especially the first week of May. 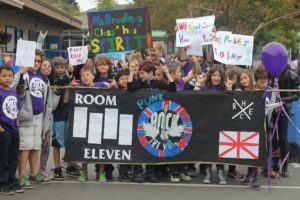 This rhythm, and the events and activities that comprise each school year, happens because parent volunteers make it happen, in partnership with the school. The fundraisers are more successful each year, thanks to the broad support of school families, but the organization and execution of all these activities is managed by a small group of parent volunteers. We need your help! In order for SACO to remain a viable support system for the school, we recognize that we need to grow involvement from more families, and specifically from more individuals choosing to get involved in organizing, leading, and volunteering in school activities. Together, we can sustain the kind of community events and regular activities that add so much value to our school. People often worry about volunteering because they think that they’ll sign up to help with one thing and suddenly will find themselves spending all of their free time helping our school. It can happen—it has happened to some of us—but it doesn’t have to happen. Over the years, we have developed a series of tasks that are relatively discrete that give parent volunteers a chance to help with a key event or activity without becoming fully involved in the day-to-day work of SACO. Some of our volunteers literally do the same activity every year—and we need their passion and dedication—but we also need others to get involved. Families transition out of our school as students get older and move on to high school. Our school and SACO is strongest when everyone contributes. The SEED Campaign has resulted in more than $125,000 since it began in the 2011/2012 school year—and all of the funds raised have gone directly into the classrooms. In 2017-18, we raised $22K+ with 53% percent participation. We’re hoping to have another strong year! We are looking for one or two trustworthy parent volunteers to coordinate the annual SEED campaign with support from the SACO Board. The SEED Campaign will begin August 10 and end September 30—so we are hoping to find a volunteer ASAP! This is the annual fundraiser that infuses SRCSA’s classrooms with funds for materials, special field trips, or whatever the teacher decides. The SEED coordinator helps develop the campaign, checks in with teachers, tracks participation, and keeps the Board and teachers updated on progress. This involves relatively frequent trips to the school office during the course of the campaign to log donations, and integrating online donations into the SEED database. If you sign up to help, you will be paired a mentor and will also be assisted by SACO’s treasurers. Each year, SACO publishes a campus directory consisting of contact information for SRCSA families who wish to share their information with the community. We are looking for a coordinator to lead the gathering of the data and to complete the mail merge, document design, and final layout, with support from the SACO Board and another parent volunteer who will assist with data entry. We begin gathering data at the Ice Cream Social and the goal is to finalize and distribute the directory to all participants by mid-October. This task is fairly time consuming but is a great way to satisfy volunteer hour requirements while working from home. SACO sends a weekly email newsletter that includes weekly reminders and updates. In past years, SACO prepared a monthly or semi-monthly school print newsletter. Ideally, the print newsletter editor receives articles and information from the school and from other parent volunteers. The project would benefit from a small group of volunteers who would work together to gather up and write the content and then lay it out. This is a great project for people looking for evening volunteer hours, and/or gaining resume-building writing, layout, and publication experience. Ever wonder why the SACO web site isn’t up to date? We could really use a volunteer to take over ongoing maintenance. This could begin by refreshing the materials available on our web site. Depending on time and interest, the role could also consist of updating it semi-regularly with information and even to refresh the look and feel of the Word Press template. This role is perfect for someone who can dedicate some time now and in the lead up to August 15, and then will be available throughout the year to assist with updates. The Yearbook Team does an amazing job photographing events, gathering photos from parents and teachers, facilitating an annual cover contest, putting together the pages of our school yearbook, and promoting book sales. Like other SACO tasks, we have a small core group of parent volunteers who make the yearbook happen—and would love to find more people to join the team. We have a parent volunteer willing to co-chair the yearbook and handle an assortment of tasks including setting the production and sales schedule, facilitating the cover contest, and leading production of the final book. We’re looking for another key volunteer to organize parent volunteers from various classes, and other photographers, to help put the book together. If this sounds like something you can help with, please let us know! We have two parent volunteers who have agreed to chair the 2018/19 Art Walk event, our school’s annual walkathon, and other experienced volunteers who will help support them and the team, but we need others to join “Team Art Walk” at the beginning of the school year. The team will find t-shirt sponsors, organize shirt orders, distribute pledge envelopes, organize class prize baskets with help from volunteers in each class, promote the event, organize the course and its fun components, and ultimately help run the day-long event that typically involves managing 50+ volunteers and facilitating participation by 450+ students, teachers, and staff. After the event, the team collects pledge envelopes and prepares for the award ceremony and gift basket drawings. We are specifically looking for a shirt captain– someone to organize shirt sponsors, printing, and distribution of the free event shirts. Each year, parent volunteers coordinate Walk and Roll to School days, and related activities, with support from the Sonoma County Bicycle Coalition. The coordinator role could be a great fit for someone who cares about reducing greenhouse gas emissions and/or who is interested in helping our students get more daily exercise. We have an experienced volunteer who has managed the program for the past 5+ years. We’re looking for one or two people to serve in a Co-Coordinator role. We are so lucky that the library is staffed by a talented, dedicated school employee, but the time she gets to spend in the library is limited due to school budget issues. Would you like to work with the school and SACO to support the library and to continue to improve its offerings? Seeking a small group of parent volunteers to make this a focus. One component could be setting up a schedule for volunteers to assist in the library, or to setting up work days, as needed, to take on specific tasks. This project will be defined by those who accept the challenge! 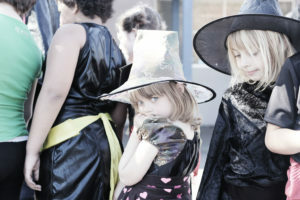 The beloved Halloween Carnival will return as an after-school event on Wednesday, October 31. We have an experienced event chair and are looking for people interested in helping organize and staff the carnival. The annual book fair typically coincides with Dr. Seuss’ birthday on March 2. We begin planning the week-long Literacy Week in January. Partnering with Scholastic to host a book fair that week provides a relatively easy center piece for the week, but there is always plenty to do ahead of time and during the fair including organizing a volunteer schedule, recruiting volunteers, staffing the fair, and planning fun events to expand the focus of the week beyond shopping. We have a seasoned Literacy Week chairperson and an incoming co-chairperson, and are looking for a couple more people who would like to help with this project. For the past eight plus years, SACO has organized the school food drive in November. We’d like to select a less hectic time of year for this event, and are seeking a new event chair or co-chairs. Organizing this event involves coordinating with Redwood Empire Food Bank to select a date, advertise the event with support from the SACO Board, distribute the bins to the classrooms, tally the results, and arrange for the bins to be picked up. The food drive typically operates over the course of one week. Each year, SACO pays for our school’s membership in Odyssey of the Mind. This allows our school to have up to 10 competitive teams and as many primary (K-2) teams as desired; teams pay a small amount to register their team and furnish their own materials. The OM coordinator, a parent volunteer, is the conduit for communication between the local OM organization and our school. Also, they arrange an informational meeting at the beginning of the school year and serve as a resource to new coaches. We are lucky to have an OM coordinator for the 2018-2019 season but coaches are needed for each team. 2018-2019 will be our school’s eighth year participating in OM! We have a small group of interested parents, and a teacher, interested in organizing garden improvements and other campus beautification activities this year. If you have expertise with drip irrigation or other garden systems or just have a passion for garden and landscape projects, please let SACO know and we’ll connect you with the group. We will be seeking volunteers for the first weekend work party tentatively planned for late September. The Spring Fundraiser is held each year with a particular project in mind. In past years, this April event raised money for musical instruments, visiting artists, and playground equipment . If your work/family schedule allows you more time to volunteer in the second half of the school year, you are very welcome to join the Spring Fundraiser team! We have several experienced people who will lead the event so this is an opportunity to learn while you help. We celebrate our teachers and staff the first week of May every year. Planning typically begins in early April and then the planning team facilitates fun activities, snacks, surprises, and a luncheon during the event week. This is a great way to get to know other parents while helping recognize our school’s amazing teachers. If you are interested in co-chairing this event, please let us know. The easiest way to reach SACO is via email at srcsavolunteer at gmail dot com. Current families are welcome to join SACO’s email list by writing to us. Everyone is welcome to attend the first SACO meeting of the year, planned for Wednesday, August 22 at 6:30 PM in the MPR.